1. Real estate activity is starting to pick up. More houses are starting to come on the market and buyers are starting to get pre-approved for a mortgage. 2. 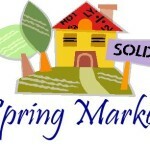 As the market starts to come alive, sellers are testing the market by pricing their houses aggressively. If you are a seller, you must know and understand the local market so that you are able to price your house appropriately and achieve the highest possible sale price. 3. If you are a buyer, NOW is the time to start the pre-approval process. Once you are pre-approved you will be ready to move forward when you find your dream house! And perhaps the biggest indicator that the real estate market is heating up is that three people have asked me for advice about getting their real estate license over the past month! Many new real estate agents will NEVER practice full time and most will move on to the next adventure after only a few months. Real estate agents come and go as the market ebbs and flows. A professional real estate agent has been around and stayed the course in strong markets and when the market is soft. Your real estate deal deserves the attention of an experienced real estate professional! Some real estate agents work for sellers or buyers, some agents try to work for both at the same time, and there are agents that just work for buyers. The latter companies are called Exclusive Buyer Agent Companies (EBA). Your real estate agent will be like the captain of your real estate team. Your experienced agent has done this many times before and will help to guide your team toward a successful transaction. Find a good real estate agent that you trust to represent YOUR interests whether you are a buyer or a seller. If you will be getting a mortgage, a pre-approval will allow you to shop for a new house with confidence! A good real estate agent will be able to help you find a reliable mortgage lender. Choose a lender based on their proven ability to get the job done correctly first, then consider the costs. Obtaining a pre-approval letter before you start your search for a new house is extremely important in this market. Your real estate agent can provide you with referrals to mortgage lenders who will help you get a mortgage. It is NEVER a good idea to work with a lender who is affiliated with a real estate agent or to work with a combination real estate agent / mortgage broker. Run away – AS FAST AS YOU CAN – from a real estate agent who ALSO wants to be your mortgage broker! Once you decide on a specific home, make an offer immediately. Your negotiating position gets dramatically worse if another buyer starts negotiating on the same home before you have a contract signed. Make sure to have your place checked out for lead, termites, radon, and/or other concerns.